Cricket Team Win Newham finals! As the defending champions, the school team, composing of Y5 and Y6 pupils (mixed) had a battle on their hands to defend their crown. With all their hard work paying off, the team won in emphatic style, winning all three of their opening games. 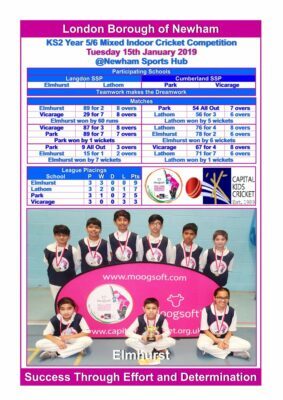 Progressing on to the Newham finals, Elmhurst Primary School were again victorious, winning all three of their follow up games and being crowned Newham indoor champions 2019. The school team will go on to represent the borough in an all-London competition. All the best! School team: Ahsan, Viret, Ali, Darsh, Ansuman, Kulsum, Nasiha, Sukaynah, Adeeb and Husnain.